Beth & Tully — everAFTER magazine everAFTER magazine celebrates and inspires a couple’s journey from their engagement through to their wedding day and beyond including lifestyle and travel. Wedding venues, bridal, fashion and styling inspiration. "My husband Tully turns ordinary into special. He makes our life together so easy and also extraordinary by doing small and thoughtful things for my daughter and I every day. It still astonishes me how the simple things he does makes us feel so loved." "Tully is a low fuss, no frills kind of guy and his wedding proposal reflected this. 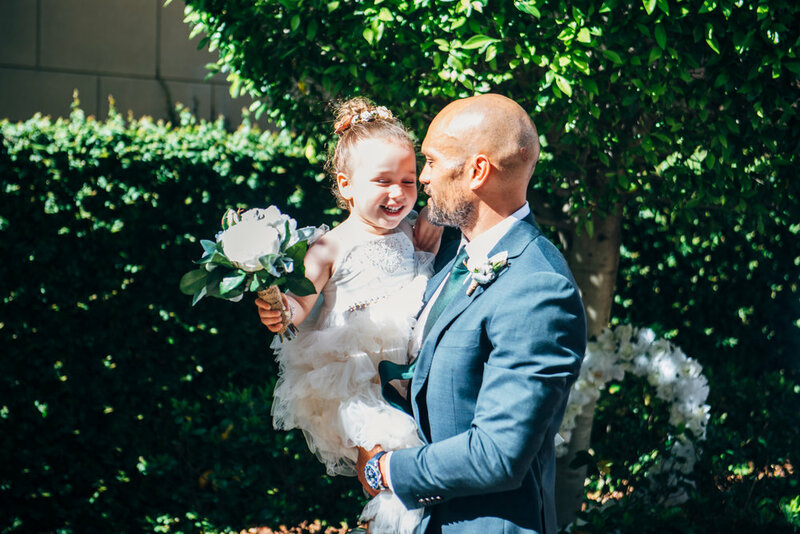 Tully didn't feel the need to get married but after having our daughter Leilah, he said he knew that being together as a family was how he wanted to spend the rest of his life. Tully took forever to propose! His Mum even suggested I book the wedding and tell Tully it was ready to go! Tully finally proposed after a beautiful dinner at Sage restaurant in Canberra. We were standing outside in the restaurant's courtyard and suddenly he was holding a ring. He said, 'I didn't want to give this to you in front of everyone.' I leapt on him, he didn't even get to ask me the question before I was screaming 'Yes'! Perhaps it's not the most remarkable proposal story but it was wonderful. A lot like our life together." Beth's daughter Leilah looked gorgeous in her dress from Dollcake. "I added sparkles with Swarovski crystals." Beth has an obsession with the reality television series, ‘Say Yes to the Dress’ and often watches back-to-back episodes with her sister. "Like many of the brides on the show, the first time I saw a Lazaro dress I got that 'wow' feeling. I saw the gown and knew I would have it for my wedding." "I bought my dress in New York while I was there for work. I wanted something unique with a splash of colour, opulent sparkle, something big, bold and maybe a bit brash, just like me! I fell in love with my dress the moment I put it on. There was only one small problem, Tully hadn’t proposed. I bought it anyway!" "I ordered a million samples to find a veil colour that matched my ombre dress. 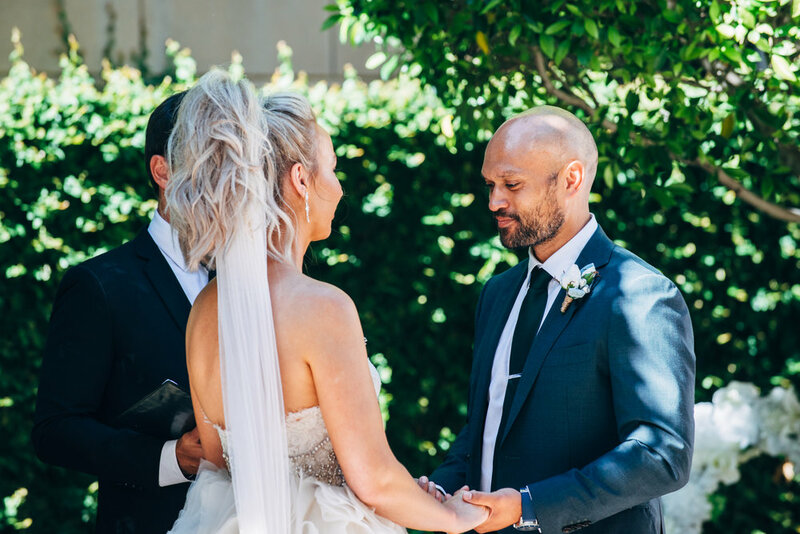 Originally I had planned to dye my veil, but after finding the perfect latte colour in silk organza I ordered a single tier veil that sparkled in the sun!" 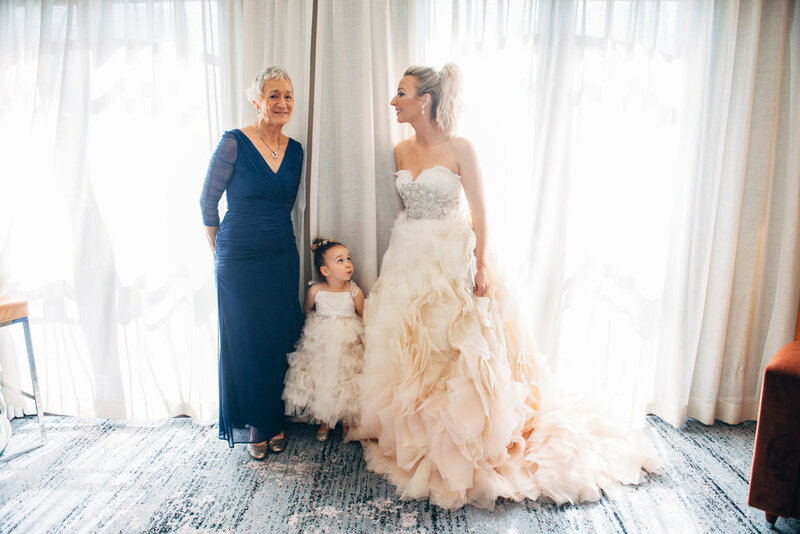 "Getting ready at Park Hyatt Melbourne with my daughter, bridesmaids, mum and mother-in-law was so special. My mum has Alzheimer’s, so involving her in the whole day made things even more meaningful. We drank Veuve Clicquot Champagne in our suite and although it was a frantic morning it was so much fun!" Beth's maid of honour bought her a Swarovski blue and gold phone case as a wedding gift. "That was my something new and blue. We joked that the ‘old’ element was the groom because Tully has been around for so long, he’s ‘old’ news!" "Ensure your chosen wedding venue has a designated wedding planner or event co-ordinator. If not, hire one! Darcy from Park Hyatt Melbourne was flawless. She executed every request we had had, paid attention to every detail and made sure the wedding ran smoothly. 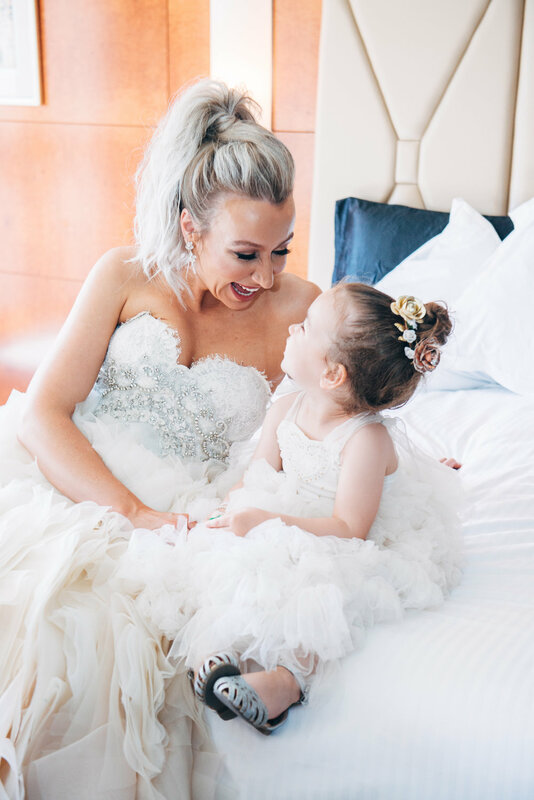 She also responded to 'emergencies'; running to our suite to get shoes for one of my crippled bridesmaids, calmed down my father-in-law who got stuck in the elevator right before the bridal entrance and was genuine and supportive throughout the entire process. Darcy took all the stress out of the day. I was so happy and relaxed. I'm sure the bubbles also helped!" "Spend money on the dress you want. If you can’t afford a new designer gown why not try Still White? That’s where I will be selling my gown!" "Tully is a true Melbournian and had stayed at Park Hyatt Melbourne before. He suggested it as a wedding venue and I'm so glad he did. After meeting Park Hyatt Melbourne's wedding team and taking a tour I absolutely fell in love with the space. It is quintessentially Melbourne but not ostentatiously modern. Park Hyatt Melbourne's style is timeless. It is classic art deco with a luxurious and opulent feel paired with an extensive list of food and drink options! Not only was the presentation of the food incredible but the taste was delicious. It was five star food, especially the lamb rack with za'atar and roasted cauliflower pilaf. For Tully and I the food was so important because you remember it for a long time after an event, good or bad!" Tully proposed on the 12th May and he and Beth were married 6 months later on 12th November. "It was the perfect amount of time, not too long to get complacent or too short to get stressed!" 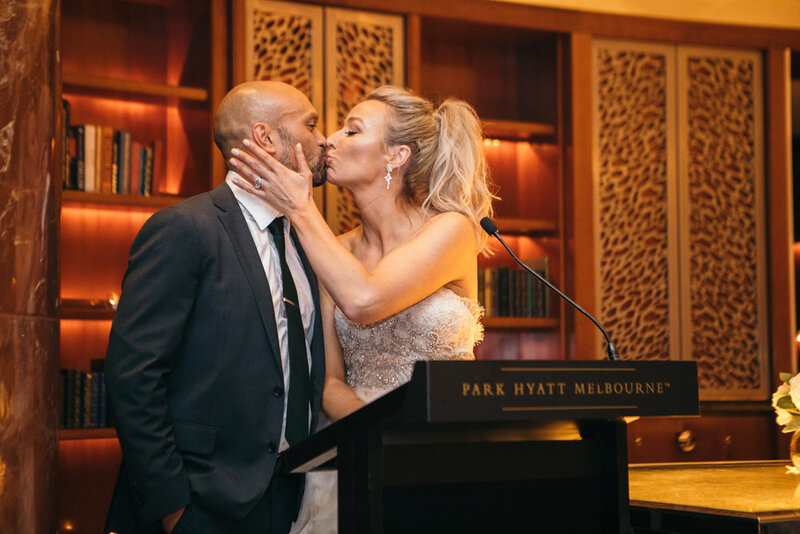 "The location was perfect, our photos are intimate and so Melbourne. 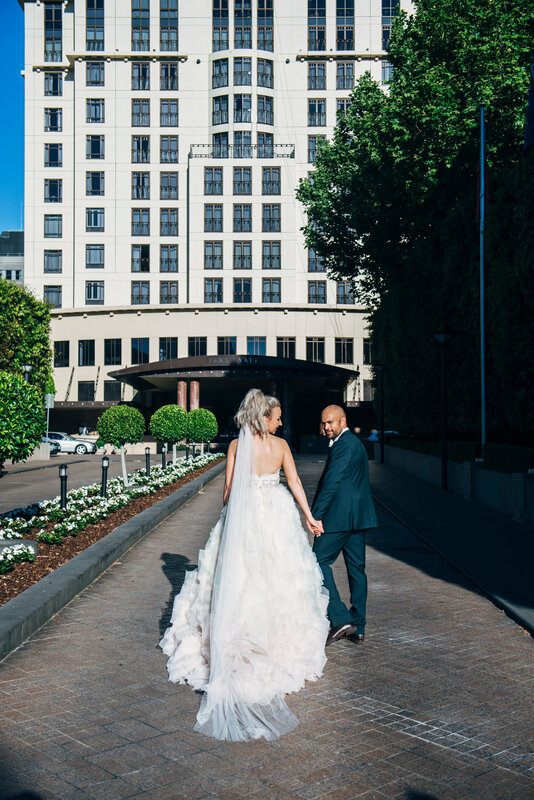 The juxtaposition between the old world luxury of Park Hyatt Melbourne in the bustling metropolis was the perfect mix, just like us!" "As Tully and his family are Maori it is part of the tradition for the family to sing the waiata after each speech. Although I expected it, it was still incredibly touching." Beth walked down the aisle to an acoustic version of Shower by Becky G, "It's our song but it's probably best not to ask why! It was the happiest moment. I was bursting with excitement and not at all tempered by our daughter running down the aisle to her Dad (out of order)! Seeing Tully see me for the first time in my dress was the best. Our ceremony was relaxed but formal and we smiled and laughed. It reflected the solemnity of the occasion as well presenting our life together, from the first time we met to raising our daughter. 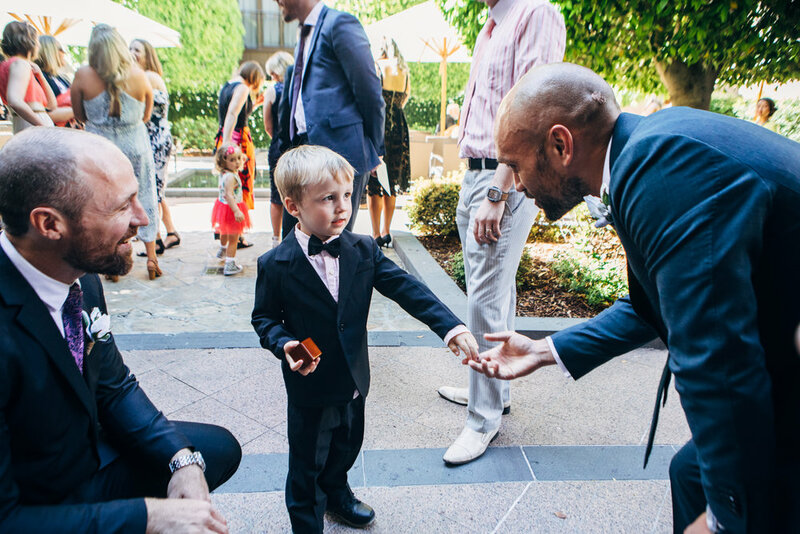 Andrew, our celebrant, brought tears to our eyes which is no mean feat, especially for Tully!" 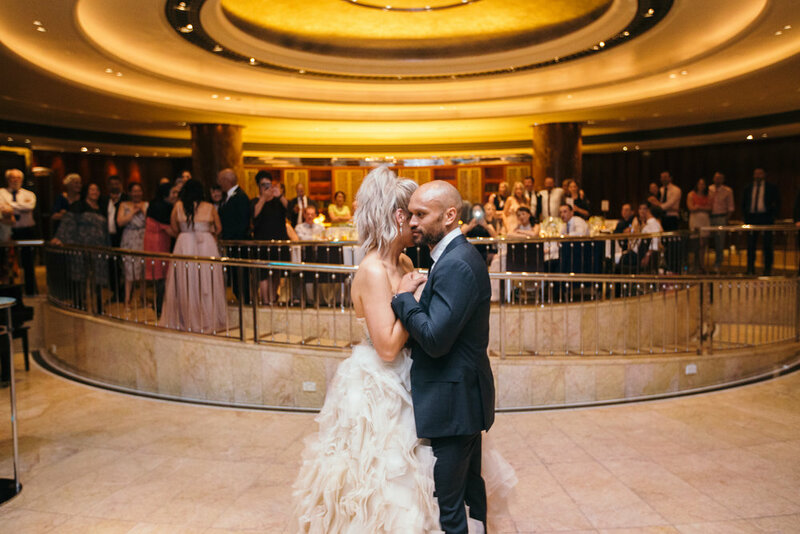 "Our wedding styling was simple and elegant with gold highlights. The colour palette was soft neutrals, with a hint of sparkle, creamy whites, dazzling gold and blush tones." For her bouquet, Beth had her heart set on white roses. "Instead of more traditional long stem roses I chose bouquets of cabbage roses with budding white roses, offset by ghost gum sprigs and gum nuts." 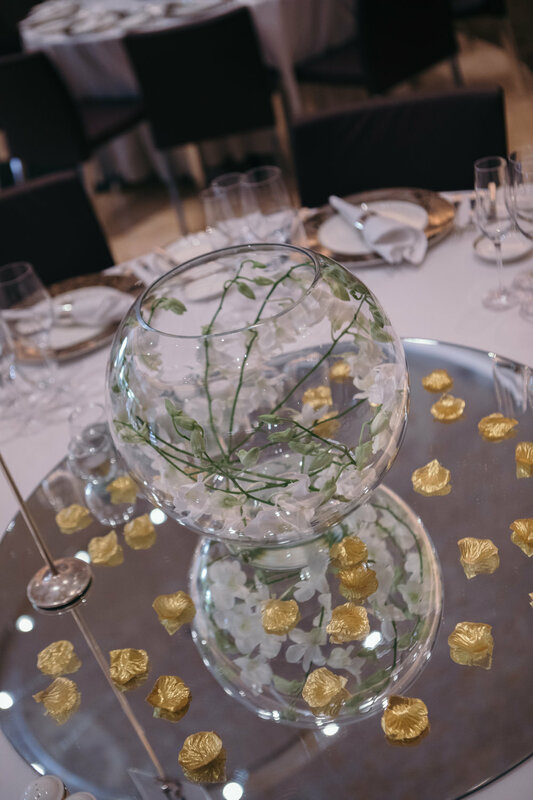 "Given how opulent the reception room was, we opted for a minimalist look for the table centrepieces of tea lights around a fishbowl vase of Singapore orchids. To add a bit of sparkle we also scattered gold rose petals. I don't have much time to get creative but I love it. I made personalised wedding favours for our guests that doubled as wedding favours. 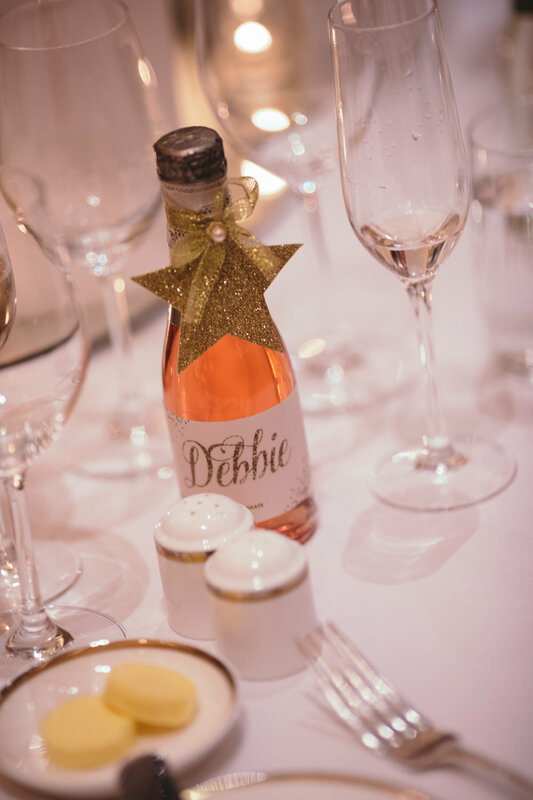 They were mini bottles of rosé and prosecco that tied in with the colour scheme as the labels were blush with gold glitter writing. Our guests seemed to love them! We also has a small candy bar, I love American sweets so we had Hershey's chocolate bars, as well as Belgian truffles!" Beth and Tully had a sweet, two-tier red velvet wedding cake, with chocolate ganache. The icing was gold rolled fondant with white and blush sugar flowers. Tully chose Otis Redding's These Arms of Mine for the couple's first dance. "I was stunned at how romantic it was. It also suited the art deco feel of the Trilogy Room; the dark wood and romantic lighting complemented the deep soul of the song. It was achingly beautiful. Best of all, as Tully said, 'It’s only 2 minutes long'!" 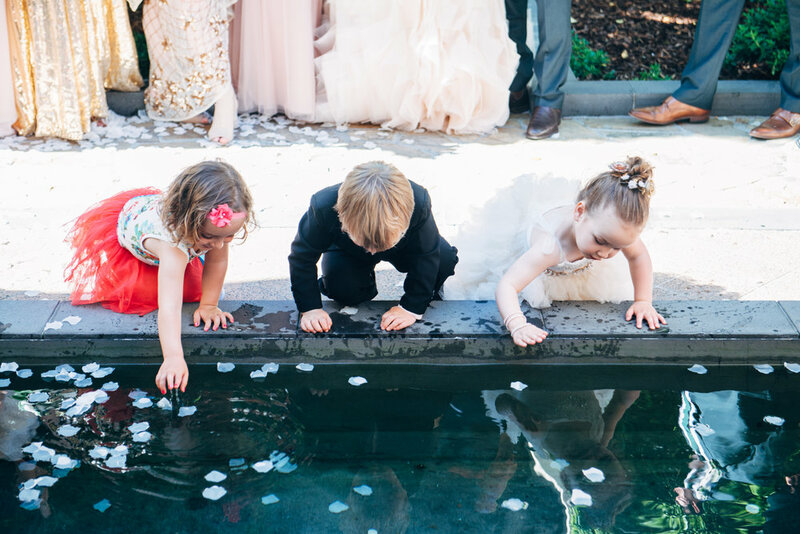 "Leilah almost fell into the water feature halfway through the ceremony! Children and animals, you can’t work with them!" Tully and his best man wore forest green suits from MJ Bale, with matching paisley patterned ties. "The colour offset the bridesmaid’s palette, and made the blush colours in my dress pop!" "My gorgeous bridesmaids are so uniquely different to each other, from petite princesses to hourglass angels so I didn’t want them to be in matching dresses. I created a website for them and asked them to buy any dress within the specified colour palette. I also asked that the dress include a little sparkle or embellishment, sequins, lace or shimmer. The dresses they chose were glam and gorgeous and highlighted the tones in my dress, from ivory to champagne, gold and blush. Most importantly, they all looked gorgeous!"